Not to say you don’t get happy accidents, because you totally do, and I think with watercolor, you always will, which is why everyone loves it. But I find as I become more familiar with the paper, the pigments, the brushes, the effects I’m getting become more intentional, I’m learning when to wait and when to steer/fiddle a bit, and overall it’s just lots and lots of fun. Quinacridone and Phthalo colors really move. They are so much fun to drop into damp paper. It’s almost like watching a scifi flick! Best not to plan too far in advance, I’m finding. I begin with a couple of shapes and then try to respond to what I’m seeing in the painting so that I can try and build a pleasing composition, and a nice size/shape balance. A sure way to wreck one of these is to plan the whole thing out. 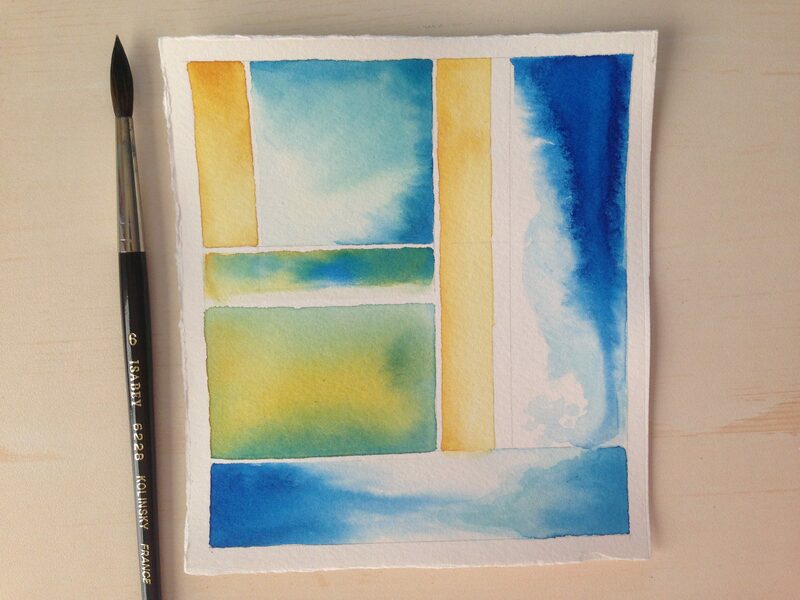 Watercolor is unpredictable enough that I do not want to squash it. Just need to let the genie out of the bottle, let it breathe, and learn to take a breath and just wait. And see what happens. Hmm…..I’m already wondering what the month of August will bring. Will I run back to acrylics? Will I stay with geometric abstracts? Have I fallen back in love with watercolor? Have we all fallen into an episode of “The Young and the Restless”?! I hope you’ll stick around and find out. I have no clue where this train is going. Choooooo choooooooooooooooooooo. Peace. I will try, thanks, Carrie! Hehe! And before I forget, that painting reflects everything you described in the post…happy, learning, growing, and fearless. Yay! I think that is inevitable for everyone who joined the challenge. Go, Laura! Go, everyone! Beautiful lively colour Laura. There are elements of sky and possibly and semi abstract windows/frames views inside views!! Thanks so much, Denis! Interesting you are seeing that and looking again at that painting last night made me think the same…….reminding me of the window series I did in acrylics earlier this year. It’s always a surprise. I’m a planner in general, but really have to let go of that with these abstracts. Your last paragraph had me giggling so hard! I do enjoy your posts, and art, Laura. I’m pretty sure whichever direction you go it’s bound to be continuosly inspirting. I love this abstract – it drew me in to each of its ‘windows’ and I felt beauty and peace. Well done! Should be a fun episode, does feel like a serial drama at times lol. Lolol. I always look forward to whatever product you are experimenting with. It is like entertainment tv! Only, not tv. I love these windows of color and surprise. Each one offers a different view of what’s beyond. I like the direction you are taking Laura. These views give me hope. I really like this, especially since I’m at the beach. Very calming. Thanks, Jean, sounds like fun! Glad you enjoyed this. Laura, you are producing wonderful images everyday. I find so much hope in these. Today’s image is very hopeful. Thank you, Kirk! I am trying to create a peaceful place in my mind as I’m also reading a book about N Korea called “Nothing to Envy”. Have you read it? It’s nonfiction. Reads like a dystopia novel. I’ve read some other books about North Korea. What a scary place. Two of our kids are stopping there today, as a matter of fact. They are off running around South Korea and will stop at the DMZ. Your images are consistently peaceful, which I appreciate. Thanks Kirk. Glad you’re enjoying them. And wow, what a strange coincidence. Thanks so much, Rebecca, really glad you’re enjoying and relieved that I am too! Yay for embracing the abstract! Definitely looks like a stained glass window. I love that description; thanks so much, Laura! Once again Laura you have produced some beautiful work. I’m really enjoying the compositions and effects you are getting. The last paragraph I can relate too, especially when painting the rose series – stepping back and looking at the painting in progress lets me see developing patterns. Thanks so much, Mary! I am having fun exploring some different options. I’m really glad you’re enjoying them. You can run back to acrylics but later! please? just kidding, you can do whatever your little heart pleases…..now you mentioned something that I have been having fun with lately. I even did this while plein air painting those trees yesterday. You start brushing on a color, spray it with a sprayer, tilt this way and that…..add another color and tilt and spray if needed but don’t overly saturate. The color spiders and mingles and makes these because blends of color and then the paper has these little portholes of white showing through, it is so fun! I have been doing this with my Madrone paintings and yesterday’s paintings. This is when it helps to have fresh paint though….and watch that you don’t make mud, stick to two or three colors. By the way, I love your painting, it reminds me of several different views of the sky. The window on the right side the way it looks like a huge wave….you are doing very well with watercolor, keep it up…..go bigger each time if you can. Wait till you are like 11 x 14 and want to even go bigger! It will be fun because you can really get into the swing of things. Thanks, M, will do! Yay for going bigger! I do like using the spray bottle too. WC really brings out the kid in me! Beautiful :-). I love the shapes and colour gradients (wonderful blooms and colour shifts!). I like tilting my paper too when using watercolours. So fun! Thanks, Myriam, it really is fun! My favorite thing about wc. Thanks so much, Susan, I’m really learning a lot from limiting my colors; not something I usually do lol! Lol me neither. But crisp is nice to gaze at. Chooo Choooooooooooooooooo lol! 😀 Glad you enjoyed it, Jodi! Yes definitely will be there with your journey! Enjoying your experiments with different mediums. Love your Geometric Series too! Laura you certainly steered the colors delightfully. Your painting reminds me of summer on the water. Laura, I spent some time looking at this image this evening. I really want to try the abstractions you’ve been doing and I looked closely at how the color moved through the image. Much of it seems to be without strokes, which gave me some ideas. I made a couple abstractions and I don’t like them at all. But I have some ideas to try again. Thanks for leading the way on this. Pretty cool stuff. Kirk, I’m so glad you’re trying them and having fun with it! The more water you use on the page, the less you’ll see any brush strokes at all and tilting the paper can hide them too if there are any to begin with. But only if there is enough paper on your surface for the color to swim in. I hope that helps. Looking forward to seeing anything you feel like sharing! Laura-thanks. I was going to add that the thing I saw and then tried was being much more generous with water. The sketch that will post tomorrow is not an abstract, but I used more water and I see myself trying that more. I like the effect. Awesome. Yes, working with wet paint on wet/damp paper is, IMO, the best part about watercolor. It’s much harder to control tho so when trying to get detailed it’s easier when there’s less water. That’s cool, glad you’re experimenting! I was just smiling as I read this, I agree with everything you discovered. I’m still discovering things as I’m sure you will also. I love the colors and geometric feel to this. It’s also a fun way to discover what blended colors will do. Yay I wanna see the dance!!! Hehe! Thank you Charlie and yes you are totally right!!! I was burned last July though, but this July is a charm! !